Do you do group classes with your homeschool high schoolers? 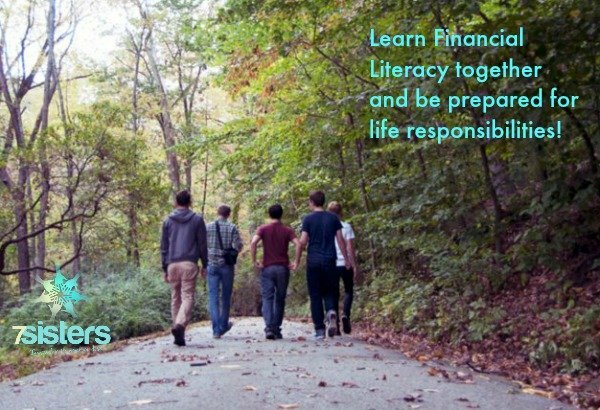 Need some great activities to get your teens excited about Financial Literacy in Homeschool Co-op? 7Sister Sara Hayes is the author of Financial Literacy from a Christian Perspective. Her interactive course has been a favorite of our local homeschool high schoolers at co-op and group classes. I have always been amazed that ANYONE could make Financial Literacy engaging and have teens actually LIKE the course. Sara can do that! I asked her what are some of the things she does with the kids in those group settings to make Financial Literacy interesting. Here are some of her favorites for teaching Financial Literacy in Homeschool Co-op. A good first-day-of-class activity (helps the students interact with one another) focuses on bartering, the difficulties associated with that system, and why the use of money in exchange for goods and services is a better system for acquiring our needs and wants. When we budget our money, we must provide for all of our needs first, then our wants. It’s essential to be able to discern a need from a want, and to realize that an item that is only a want for one person may be a true need for someone else. Activity: Determine whether each of the following items is a need (N), a want (W), or could be either a need or a want (N/W), depending on a person’s situation! For those above labeled N/W, explain in what situation the item is only a want and in what situation it is a true need. As a classroom activity, I place three signs in three different locations in the classroom. One sign says *NEED*, one says *WANT*, and one says *NEED/WANT*. I (the teacher) name one item listed above, and each student moves to the sign that, in his/her opinion, correctly identifies the item as a NEED, WANT, or COULD BE EITHER. I tell the students at the start of the activity that they should not watch to see where anyone else goes — each student should decide for him- or herself. Then I (the teacher) ask a student at each location to tell the class why he/she made that choice. Another activity from Financial Literacy from a Christian Perspective that can be used in class is to go to the website http://www.coinnews.net/tools/cpi-inflation-calculator/ to see the effects of inflation over time. 3) another year they choose (could be a random choice or a year that’s meaningful to them or to a family member, for example, the year their parentswere married). Here is a video we watched in class on how interest on credit card debt can mean that it may take YEARS to pay off the debt if only a small amount is paid each month. Very eye-opening for students! https://www.youtube.com/watch?v=Vz05A6cP6Iw “Credit Card Debt Explained with a Glass of Water”, TotalDebtRelief. Discuss with the class: The minimum payment in this video is lower than it would normally be on a debt of $10,000. Often, the minimum payment is 4% or $20, whichever is greater. 4% of $10,000 is $400, which would be a common minimum payment for this amount of debt. Take the class to Calculator.net’s Credit Card Calculator http://www.calculator.net/credit-card-calculator.html and fill in the debt amount, APR of 17%, and monthly payment amount of $400.00. See how low it will take to pay off this debt while paying a common minimum payment. Play with the monthly payment (for example, increasing it to $410 per month — just $10 over the minimum). Have the students discover the benefits of paying more than the minimum, even if just a small amount. What percentage of the total amount paid is principle and what percentage is interest? Financial Literacy from a Christian Perspective has a chapter on Insurance. The activity below introduces the idea of risks in life and one way of managing those risks: Reducing the Risk. Set up two columns on your classroom whiteboard. The heading of the first column is *RISK*; the heading of the second column is *HOW WE REDUCE RISK*. Now pair up the students, each pair taking one other risk that was brainstormed by the students and come up with ways to reduce that risk. Have the pairs report to their classmates their ideas for reducing their particular risk; see if the classmates have additional ideas. Also in the Insurance unit in Financial Literacy from a Christian Perspective, we learn that it is wise to make a Personal Property Inventory list because it is very difficult to remember all your belongings in the event of a fire or other disaster. In class, each student makes a list of belongings in his/her bedroom under the headings *FURNITURE/DECORATIONS*, *CLOTHING*, *ELECTRONICS*, *SPORTS EQUIPMENT*, *JEWELRY*, *BOOKS*, *PERSONAL/MISCELLANEOUS* everything he/she can remember. same headings, write down those items they had not remembered. Students will realize that if they forgot a few or even numerous items in just one room, imagine how much they could forget in an entire house or apartment! A practical in-class activity is to have the students all fill in a W-4 form (the form that will enable their employer to take out the appropriate amount of withholding taxes from each paycheck). Download your copy of Financial Literacy from a Christian Perspective today! 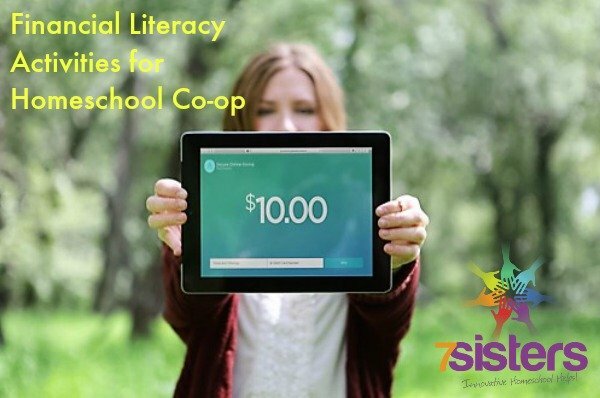 And comment below with more ideas for Financial Literacy in Homeschool Co-op! Click here to read what a graduate has to say about the importance of Financial Literacy. Next Post: The Homeschool Highschool Podcast: Episode 3 Will My Kid Get into College?